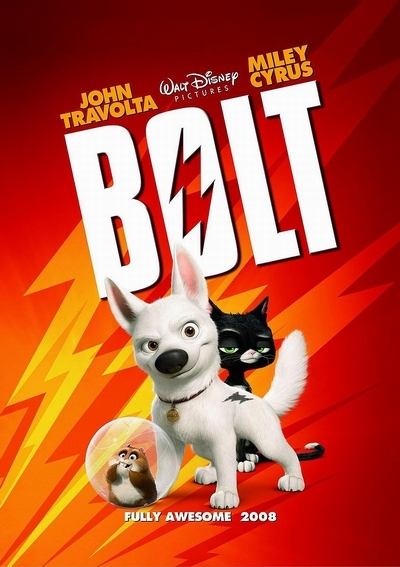 Story: From Walt Disney Pictures comes an animated comedy adventure featuring a super-dog named BOLT (voice of John Travolta), whose days are filled with danger and intrigue - at least until the cameras stop rolling. When the star of a hit TV show is accidentally shipped from his Hollywood soundstage to New York City, he begins his biggest adventure yet - a cross-country journey through the real world to get back to his owner and co-star, Penny (voice of Miley Cyrus). Armed only with the delusions that all his amazing feats and powers are real, and the help of two unlikely traveling companions - a jaded, abandoned housecat named Mittens and a TV-obsessed hamster named Rhino - Bolt discovers he doesn't need superpowers to be a hero.